Tracking variable hourly employees can be challenging. This is especially true in the hospitality, retail and security industries where high turnover along with resource balancing leaves you wondering when and to whom insurance needs to be offered. Nimble Reporting has this covered. We monitor and track employee hours, determine what type of employment gaps should or shouldn’t be included based on the health care regulations. 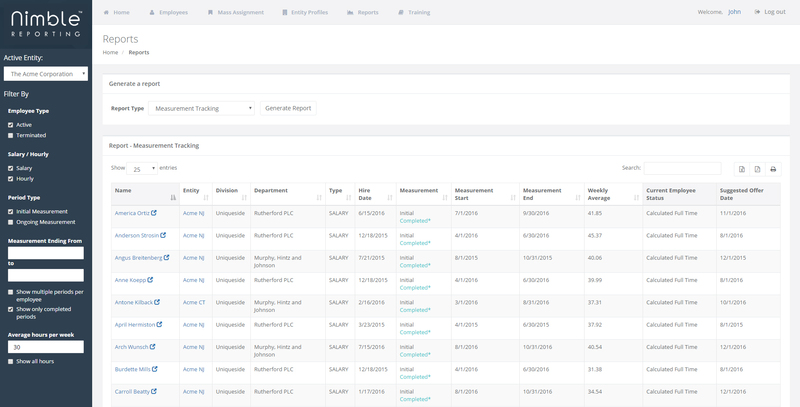 TIP: Our advanced reporting tools allow you to track employee hours at any threshold. As an example, your organization may offer ancillary benefits after an employee has averaged only 25 hours per week for their first 90 days (the ACA threshold is 30 hours per week).